There is only one name that immediately comes to mind when the word “SUV” is mentioned. That name happens to be the longest continuously used nameplate of any vehicle in the world. That name is the Chevrolet Suburban. The Suburban got it’s start back in 1934, and has been a recognized staple on the American roadway ever since. It's the largest SUV available on the market today, and it includes three rows of seating to accommodate up to nine people. The Suburban has taken many different appearances and forms over the years, with twelve generations since it first rolled off the assembly line in 1935. The 2015 Chevrolet Suburban marks the first version in the newest twelfth generation of the vehicle. In March of 2015, Chevrolet celebrated their longest-running nameplate’s 80th anniversary, unveiling the 10 millionth vehicle built at the Arlington Assembly Plant since it opened in 1954 - a black 2015 Chevy Suburban LTZ. Aside from being around for a long time, the 2015 Chevrolet Suburban continues to win over drivers all over America with it’s far-reaching capabilities, exceptional safety features, and impressive technology. The 2015 Chevy Suburban is the most exceptional version of the large SUV to date, and proves that fact time and again with all it has to offer. The Chevrolet Suburban has experienced the longest running nameplate of any American-made car, and also holds the title internationally. The large SUV just celebrated it’s 80th birthday, and there is absolutely no sign that the Suburban will be ending its run anytime soon. Despite the decrease in overall SUV sales toward the beginning of the 2000s, the Chevy Suburban has held strong in sales worldwide. The Suburban is currently enjoying its twelfth generation, with a thirteenth generation expected to debut in 2019. The fact that the Suburban has been around for eight decades just proves it’s viability as a strong, powerful, and dependable vehicle. When it comes to purchasing a full-size SUV, no other vehicle quite lives up to the name, reputation, and quality that the Chevrolet Suburban has earned. The 2015 Chevy Suburban is packed so full of incredible features, that listing each one is nearly impossible. From the exterior showmanship, to the practical and luxurious interior, the 2015 model is impressing every person who it comes into contact with. Check out a few of the noteworthy features that are new to the twelfth generation 2015 Chevrolet Suburban. The EcoTec3 engine powers the 2015 Suburban, helping it achieve 22 mpg on the highway, while maintaining it’s power and strength. With power fold-flat second and third row seating, the Suburban can pack more cargo than ever before. WIth a maximum cargo capacity of 121.1 cubic feet, the Suburban can surely accommodate anything that needs hauling. Second-row passengers will have limousine-like legroom, thanks to the extra two inches of room between the first and second row. Entry and exit is also made easier thanks to the extra space. The available eight-inch color touch screen display with the newest MyLink generation of connectivity, ensures the latest technology and connectivity at your fingertips. Up to six power outlets, and six USB ports, the 2015 Suburban can charge up to twelve devices at the same time. With the 110-volt three prong outlet, nothing will get left behind when keeping charged up on the road. Whether driving across town or across country, passengers will appreciate the optional rear-seat entertainment system with dual screens and Blu-Ray player. Keeping passengers entertained on the road will be easier than ever in the 2015 Suburban. Never miss a beat by sitting in the front seat of the Suburban. The overhead-console mirror provides the driver and front-seat passenger with a panoramic view of the interior cabin. Whether keeping an eye on the baby, or staying connected to a conversation - this is a feature that no driver should be without. More than mpg ratings, on-board technologies, and name recognition, the 2015 Chevrolet Suburban values safety. The highest level of quality and attention to detail was used when designing the 2015 Suburban safety features. The newest technology is employed to ensure the safest possible ride in the bowtie brand’s longest-running nameplate. Take a look below at some of the stand-out safety features that the 2015 Suburban has available to keep you and your passengers safe. 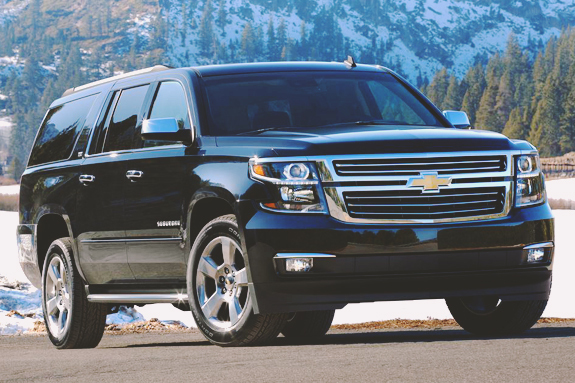 Rear-Cross Traffic Alert: The 2015 Chevy Suburban is one of the largest passenger vehicles on the road today. Drivers may find it difficult to navigate the large SUV without assistance from the radar sensors and backup camera employed on the 2015 Suburban. This technology will warn drivers of approaching traffic and other obstructions from up to 65 feet away when backing up. Perfect for crowded parking spaces, and busy streets. Forward Collision Alert: This system warns drivers of threats of upcoming front-end collisions. Drivers can set the gap warning for “Far,” “Medium,” or “Near” to ensure a comfortably safe ride. Lane Departure Warning: This standard offering on the LT and LTZ trim levels uses a rear view mirror-mounted camera to alert drivers when they drift unintendedly from their lane. Side Blind Zone Alert with Change Alert: This available technology warns the driver of fast-approaching vehicles in an adjacent lane from up to 230 feet away. Safety Alert Seat: The Suburban will alert drivers of potential collisions with right and left side seat vibrations with this new technology. Rear Vision Camera: All 2015 Chevy Suburban SUVs come standard with this technology which helps drivers maneuver the full-size vehicle safely and efficiently. Front Automatic Braking: Through the use of radar and ultrasonic sensors located on the bumpers of the Suburban, this available technology will alert the driver if an upcoming vehicle is rapidly slowing down, and automatically applies the brakes if the driver does not do so in a timely manner. All of the above safety features help make the 2015 Chevrolet Suburban one of the safest vehicles being driven on the road today.